The Ultrabook, a new class of ultraportable laptops defined by Intel, has been making waves lately as the next major step in laptop design. These ultraslim and lightweight laptops promise to combine the conveniences of tablets with the functionality of larger notebooks. If Intel and Ultrabook manufacturers can get the design and technology right, Windows users may finally have relatively affordable and varied alternatives to the reigning ultrathin laptop, Apple’s MacBook Air. In addition to the much thinner and lighter laptops we’ll see this fall, you can expect combo devices with sliding or removable multitouch screens for true all-in-one versatility. Here’s what you need to know about Ultrabooks and whether you should prepare to purchase one. Ultrabooks are laptops based on reference designs that Intel announced at the Computex trade show in May. Although Intel makes computer chips, not entire laptops, the company has provided the Ultrabook specification (five different ones, actually) to laptop manufacturers so that they can produce a new army of “thin, light, and beautiful” portables. Intel defines Ultrabooks as having Intel Core processors, a thickness under 21mm (0.8 inches), and a long battery life (initial Ultrabook models are rated for at least 7 hours). They also share 11- to 13-inch displays, a weight under 3 pounds (closer to 2.5 pounds), and a near-instant resume from sleep, thanks to their solid-state drives. Ideally--and this is the kicker--Ultrabooks should be priced at under $1000. In short, Ultrabooks are designed to be inexpensive, high-performance, and svelte laptops. 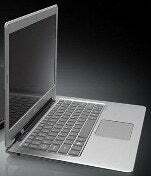 In concept, Ultrabooks aren’t really new: After all, the MacBook Air meets the criteria, and Apple revealed it in 2008. And the laptop industry as a whole was already racing to thin-and-light long before the MacBook Air made skinny popular; five years earlier, for example, we had the 2-pound Sony VAIO x505. Some people might argue that the MacBook Air is an Ultrabook, but “Ultrabook” is also a marketing term that Intel trademarked this year--a term that describes the laptop PC’s comeback attempt in a world of rising tablet and smartphone fame. To date, if you wanted a well-designed, high-performance ultraportable laptop--something that you could easily carry everywhere without having to worry about looking for an outlet every couple of hours--and specifically one that cost about a grand, you’d have to turn to the MacBook Air. As PCWorld laptops editor Jason Cross has pointed out, Windows laptop makers haven’t been able to keep up with Apple in its innovation, marketing, and pricing for the MacBook Air. Ultrabooks, however, may be the first worthy MacBook Air rivals, machines that can compete on all levels: design, hardware specs, and price. And Intel is pushing for innovation beyond the MacBook Air model. Asus UX21: The first Ultrabook to be introduced, this 2.4-pound laptop has an 11.6-inch display, a 0.66-inch thickness, and an Intel Core i7 processor. It’s expected to start at under $1000 and launch this month. Toshiba Portege Z830: Billed as the “world’s lightest 13-inch laptop,” the Z830 starts at just under $1000, is 0.63 inches thin, and weighs under 2.5 pounds. Acer Aspire S3: Launching at 799 euros ($1134) and promising to capture the MacBook Air feel, the 13.3-inch Aspire S3 offers a Core i3, i5, or i7 processor and a choice between a traditional hard drive or an SSD. Lenovo IdeaPad U300s: This 13.3-inch Ultrabook is expected in November starting at $1200. The U300s will be available in Core i5 and i7 models, and will have a Clementine color option. Should You Buy an Ultrabook? This year’s Ultrabooks are truly attractive laptops--for both business and personal use, and especially for travel. They’re powerful, flexible, incredibly thin, light, and durable. If you need a laptop right now, these are among your best options. However, at the moment Ultrabooks aren’t the great value we first envisioned (due to manufacturers’ issues with high costs and limited supplies), and laptop makers are taking a wait-and-see approach to this new portable category, despite Intel’s $300 million investment in the project. If you have a couple of months to wait, you could see these Ultrabooks drop in price and become even more attractive. Alternatively, you might prefer to get in touch with Windows 8 Ultrabooks next year, or hold out for Ultrabooks with 24-hour battery life, which are due in 2013.